The Renault K4M engine is not new. Renault uses it for install into their models since 1999 (Renault Megane, Renault Clio II, Renault Laguna and others). 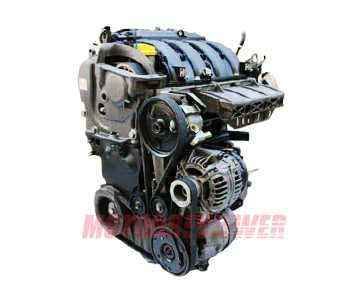 The engine itself is further development of the K7M engine. The K4M got new 16-valve cylinder head, two light camshafts, other pistons and hydraulic tappets. Some versions are equipped with the VVT (Variable Valve Timing) system. The maximum power and compression ratio are varied for some models. The K4M has a timing belt. The replacement of rollers and belt is required every 40,000 miles. Compared to the K7M engine, the K4M operates quieter, smoother, with fewer vibrations, consumes less fuel and more powerful. Renault also produced sports version - the K4M RS. It has performance cylinder head and camshafts. Engine power is 136hp. This engine was designed for a small budget car and had to be cheap and reliable. But the K4M has more expensive parts and components compared to the K7M. It should be noted that K4M engines are sensitive to fuel quality (unstable work).